Have Three Kids, You Will Barely Notice the Difference | Have kids, they said. It'll be fun, they said. Right. Good one. HiLARious. 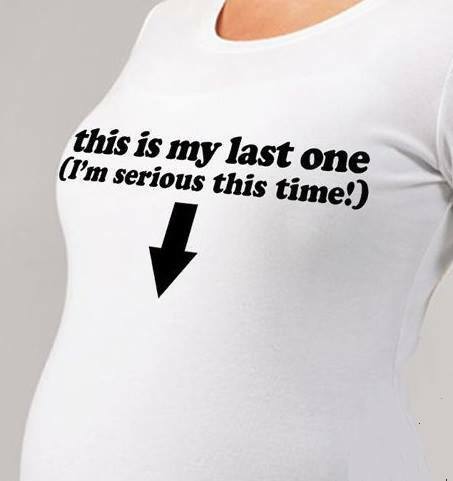 Yes – a good, dear friend of mine told me this after I’d had two kids. Now, she does have three kids (three girls even) so, naturally, I believed her. And then I had three kids. And then, I glared at her. And pointed my finger in her direction. And said, “You. Lied”. This picture is circulating around social media at the moment. How do I know this? Well, because it has been sent to me. I’ve been tagged in it. It’s been posted to my Facebook page. Three times. 1. Yes, that does reflect my brain. Quite accurately. 2. I’m not sure if I should be concerned, or proud, that so many of my friends think of me when an image like this surfaces. 3. I really, really want devilled eggs. Yum. A lot changes when you go from two to three kids. 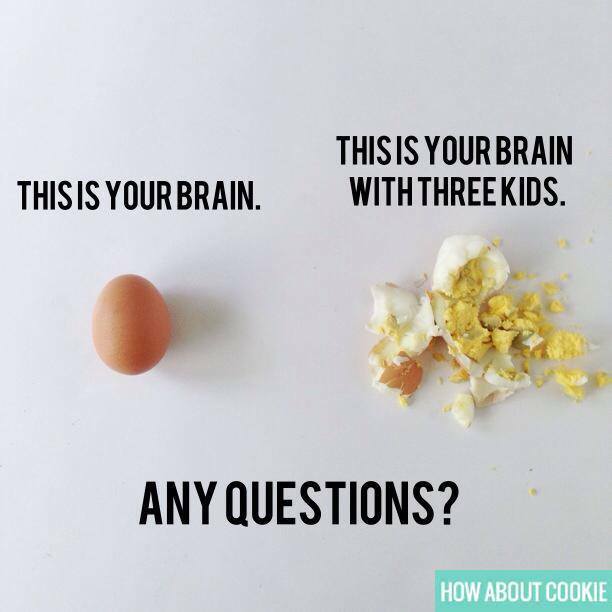 Which doesn’t make sense, because it’s not like you are going from one to two kids. THAT was double. So why, oh why, is this so much more? My cousin has three kids, and he said to me while I was pregnant with #3, that, regardless of who is home, as long as one child is not there, things will run smoothly. And he is 600% correct. It doesn’t matter what combination is here, things are a lot easier to deal with when one is absent. Again, I’ve no idea why. Some significant differences you will certainly notice when you go from two kids to three. 1. You simply don’t have enough arms. Or eyes. Or hands. You learn pretty quickly how to watch all three kids at once, no matter how far spread they are. Which can make me appear a bit twitchy – trying to discuss something with a store person while simultaneously feeding BabyGirl in the pram, batting Princess’s hands away from the glass cabinet full of ceramic Fairies and watching to make sure BoyChild doesn’t suddenly scoot out the main door, prepared to drop all and dash if he does. I have a double pram and it is amazing. Three kids? Get a freakin double pram. 2. Things are much more expensive. Food is more expensive. I had three in nappies for a short while, so obviously that was expensive. But now I have three kids who eat a lot of food. We go through tons of bread and milk. And bananas. A 1kg of minced beef used to easily be split into thirds and frozen but now I’m having to split it in half, or bulk it out with other fillers. Don’t even get me started on takeaways. Three Happy Meals?? And, the kids are still little. I hate to think what it’s going to be like when they are all teenagers. Goodness me. And, it’s not just the food that’s expensive. Three lots of friends having parties. Three lots of extra-curricular activities. Three lots of clothing. Three lots of therapy for Mum. Just kidding. 3. Sleeping through the night. Or rather, not. There are some nights, when, with absolutely NO exaggeration, I am up with the kids non-stop through the night. Not because one is up, but because all three get up, at different times. It’s like they plan it. It’s like they know. 4. Bigger EVERYTHING. With three kids, you need a bigger house. We have a three-bedroom and I would love a fourth bedroom. Having two sharing is less than ideal, especially when they don’t sleep (see above). We needed a bigger car. Yes, cars have five seats. But a lot of cars don’t fit three carseats across the back. And, do not talk to me about installing the damn things. It has taken a year of practice for me to have mainstreamed the process to under half an hour. But, you can guarantee I’ll be cursing by the end of it. 5. More mess. Three kids. Three ages. Three stages. Three phases. When one leaves a phase, one enters it. Just when you think you can get rid of all the annoyingly noisy toys, the next kid discovers them. 6. It’s takes an eternity to get ready. It’s a wonder I’m not a hermit. You can bet as soon as you finish dressing them all, one needs to pee, one has spilt something, one has lost their shoes and one needs to pee AGAIN. 7. “GEE! You must be BUSY. You clearly have your hands FULL.” *sympathetic pat on shoulder*. It’s three kids, not seventeen for goodness sake. Do I really look that frazzled?? Of course, there are lots of advantages to having three kids. And I’m sure I’ll discover them soon. Just kidding. I adore all three kids, and they certainly have their own personalities. The great thing about three kids is, well, having all three kids. Because I couldn’t pick one to get rid of. Not that I’ve considered it. Often. I love them all, the little monkeys. And I know, I’m very lucky to have them. Princess tells me this regularly. And, you know what they say – once you have three, you might as well have four. You won’t even notice the fourth. Three is fine, thank you very much.